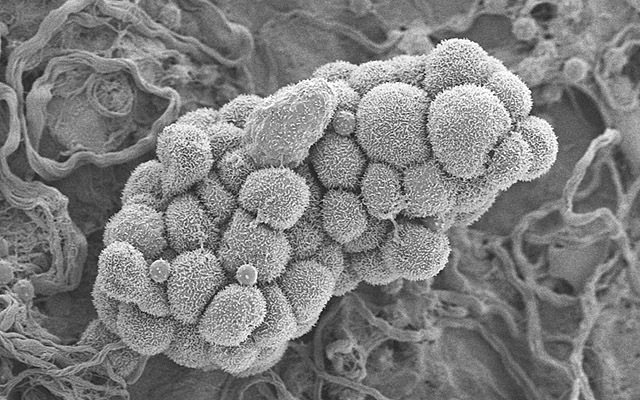 Ovarian cancer cells forming small tumor. Image courtesy of University of Gothenburg. The findings extend the anti-cancer potential of an experimental monoclonal antibody called cirmtuzumab, developed at UC San Diego Moores Cancer Center by Thomas Kipps, MD, PhD, and colleagues. Cirmtuzumab is currently in a first-in-human phase 1 clinical trial to assess its safety and efficacy in treating CLL. Cirmtuzumab targets ROR1, a protein used by embryonic cells during early development and exploited by cancer cells to promote tumor growth and metastasis, the latter being responsible for 90 percent of all cancer-related deaths. Because normal adult cells do not express ROR1, scientists suspect ROR1 is a specific biomarker of cancer cells in general and cancer stem cells in particular. Because it appears to drive tumor growth and disease spread, they believe it also presents an excellent target for anti-cancer therapies. Earlier research by Kipps and colleagues has shown a link between ROR1 and both breast cancer and CLL. In their latest PNAS paper, Kipps and colleagues investigated whether cirmtuzumab also might be effective against ovarian cancer, which has rebuffed efforts to find a cure or long-term remedy. Most ovarian cancer patients initially respond well to standard chemotherapy, sometimes appearing to become disease-free, but 85 percent relapse within two years after systemic treatment, often with a more aggressive and disseminated form of the disease. More than 21,000 women are diagnosed with ovarian cancer annually; more than 14,000 die from the disease each year. The 5-year survival rate after diagnosis is 44.6 percent. The Moores Cancer Center team found that ovarian cancer stem cells, which are thought to be responsible for cancer recurrence and metastasis and are largely resistant to standard chemotherapies, singularly express ROR1. Patients whose tumors had high levels of ROR1 experienced more aggressive forms of ovarian cancer. They had higher rates of relapse and shorter median survival times than patients with lower levels of ROR1. The researchers tested their theory in transgenic mice lacking an immune system, which allowed them to graft human ovarian cancer tumors into the animals. “The tumors grow just like they would in a human patient. They maintain the same genomic complexity and microenvironment,” Kipps said. Some of the tumor-engrafted mice were then infused with low doses of cirmtuzumab, which appears to induce senescence in cancer stem cells, degrading their ability to grow and metastasize. “It seems like ROR1 may be required to keep cancer stem cells healthy,” Kipps said. The scientists found that mice with tumors treated with cirmtuzumab did not form new tumors – the disease did not metastasize – and residual tumors appeared to be depleted of cancer stem cells. When these latter tumors were engrafted into new mice, they did not flourish or spread. “The phenotype of cancer stem cells has been well defined for cancers from several organs, but reliable biomarkers for cancer stem cells in ovarian cancer have remained elusive. ROR1 promises to provide such a biomarker,” said Robert C. Bast, Jr., MD, professor and vice president for translational research at the University of Texas MD Anderson Cancer Center. “And the anti-ROR1 antibody is a promising candidate for targeted therapy, either alone or conjugated with toxic peptides or small molecule.” Bast was not part of the study team. Co-authors include Suping Zhang, Bing Cui, Hsien Lai, Grace Liu, Emanuela M. Ghia, George Widhopf, Zhuhong Zhang, Christina C.N. Wu, Liguang Chen, Rongrong Wu, Richard Schwab and Dennis A. Carson, all at UC San Diego Moores Cancer Center. Funding for this research came, in part, from the National Institutes of Health (grant PO1-CA081534), the California Institute for Regenerative Medicine, the Blood Cancer Research Fund, UCSD Foundation and Cancer Center Support Grant P30CA23100.